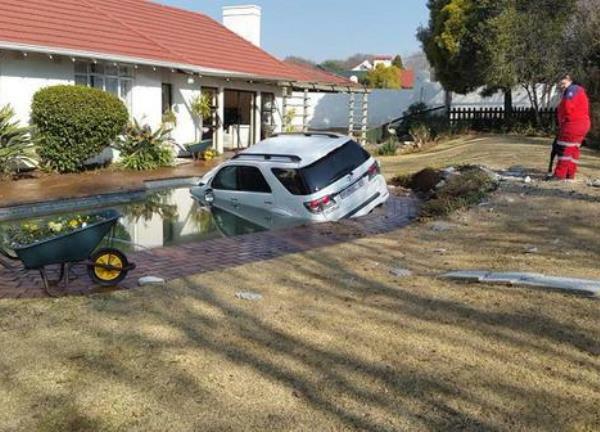 Paramedics responding to an accident in Roosevelt Park, west of Johannesburg on Friday were met by an unusual sight - an SUV "parked" in a residential swimming pool. Apparently the SUV, sitting window high in the pool, was involved in a collision with a light motor vehicle at the intersection of Fifth and Pieter Wenning Roads, causing the SUV to crash through the fence and come to a rest in the swimming pool. ER24 spokesperson Russel Meiring said fortunately no one sustained any injuries, and that the driver of the SUV managed to free himself from the car prior to their arrival on the scene. "Paramedics assessed the driver of the light motor vehicle and SUV. Fortunately both drivers escaped injury."